Because of St. Patrick's Day, we felt compelled to make an "emergency stop" on a green isle of Ireland this week. 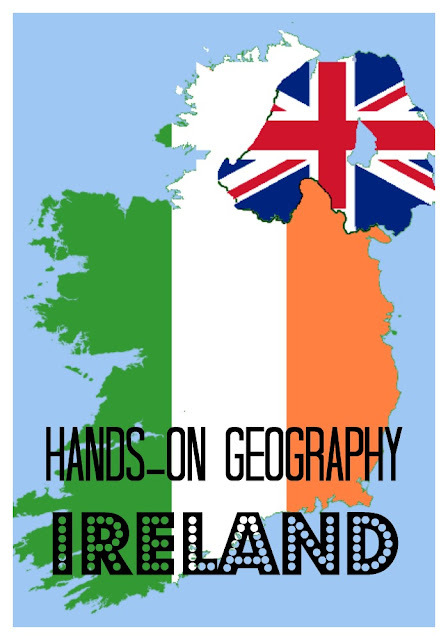 In this geography unit I collected books, videos, web resources, and hands-on activities to introduce elementary school children to Ireland. 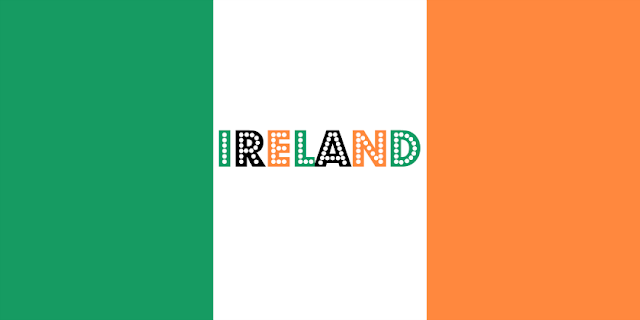 Ireland was a lot more familiar to Smarty than other countries that we visited previously, because, after all, we "visited" it in preschool and talk a little about it every St. Patrick's Day. She could not name the capital or any Irish landmark, but she knew that it's an island in Europe. She also remembered a story about potato famine in Ireland - she learned about it from listening to The Story of the World. Our best friend is of Irish descent, and he brought Smarty a book called Favorite Irish Legends from his trip to Ireland. While this book was not available on Amazon or in our local library, many other great books tell tales of Irish mythical heroes such as Fionn mac Cumhail (often translated as Finn MacCool) or Cu Chulain. Of course, Smarty, being a huge lover of legends around the world, loves these books. 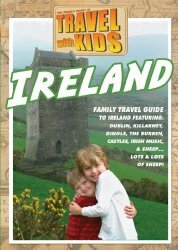 Since we are Amazon Prime customers, we can watch Amazon Prime videos for free including this Travel for Kids: Ireland program. It actually includes 3 different 30 minutes episodes introducing Dublin, Clare County and Killarney/Blarney Castle. Smarty enjoyed the videos - she saw real kids traveling with their parents and soaking up past and present Ireland. Now she is itching to go too! My blog friend Ticia from Adventures in Mommydom has reminded me in one of her recent posts about the concept of Web Quests. I was investigating this for another project and stumbled upon Quest Garden where I found a lot of interesting quests about Ireland. Some of them are designed for group work, but there are some web quests for individuals as well. I wanted Smarty to try Ireland: Emerald Isle, but she was not interested once she realized that it involves writing or typing. 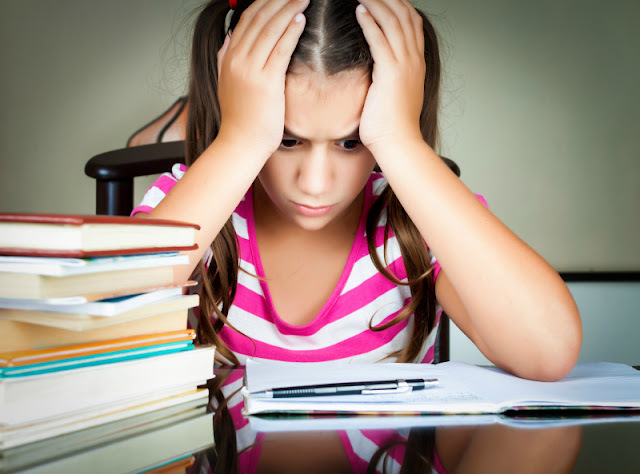 However, this is something that you might want to explore in your homeschool. In the past we did St. Patrick's Day math challenge, made a special rainbow day, and designed leprechaun traps. You can find even more great ideas for Ireland on my St. Patrick's Day Pinterest board. 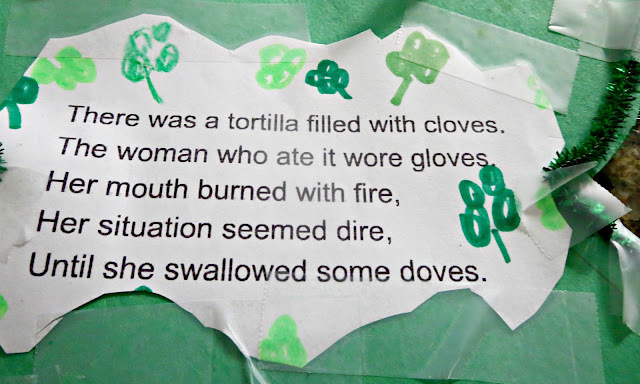 But this year Smarty felt like writing some limericks to get into the mood for St Patrick's Day and celebrate Ireland. 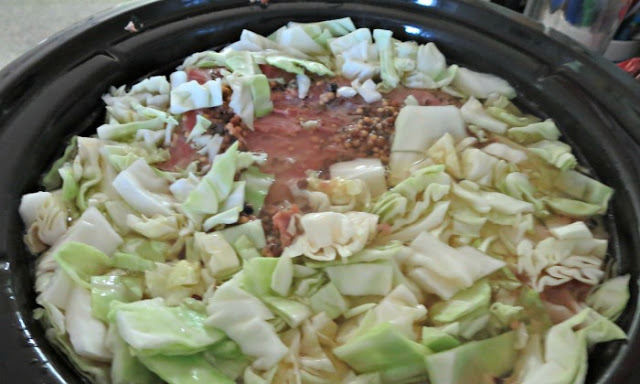 Well, nothing but corned beef and cabbage would do for St. Patrick's Day :) I repeated my success from previous years and made slow cooker corned beef and cabbage following this recipe. The only change I made in this recipe (it's also highlighted in many reviews) is that slow cooker setting should be on low, not on high. 20 minutes of peeling and cutting in the morning = delicious Irish dinner in 8 hours! Are you celebrating St. Patrick's Day in your family? I have to admit I don't like corned beef and cabbage, and my one try at cooking it didn't go over well. I thought I was making this big sacrifice to make a meal Jeff loved, and he didn't really like it. Oh well. We had Irish Beef Stew tonight, which I should have started cooking significantly earlier..... But the bread was a hit. What a great unit! I need to try that recipe.